Sudoku is played over 9x9 grid, in each row there are 9 slots, some of them are empty and need to be filled. The bottom line : the letter should appear only once a row, column or area. However – above all the ultimate challenge behind it is doing it fast! Apparently there are 6,670,903,752,021,072,936,960 possible games, so the first one is just a beginning of an extremely fun game – you are just warming up! 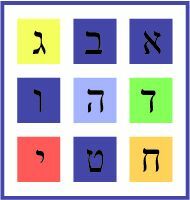 Enjoy the weekly Aleph Bet Sudoko!